Dear Mr. Ham: You Can't Have It Both Ways : 13.7: Cosmos And Culture Last week's debate on evolution vs. creation attracted millions of viewers. Commentator Tania Lombrozo takes on Ken Ham's assumptions about science and belief. 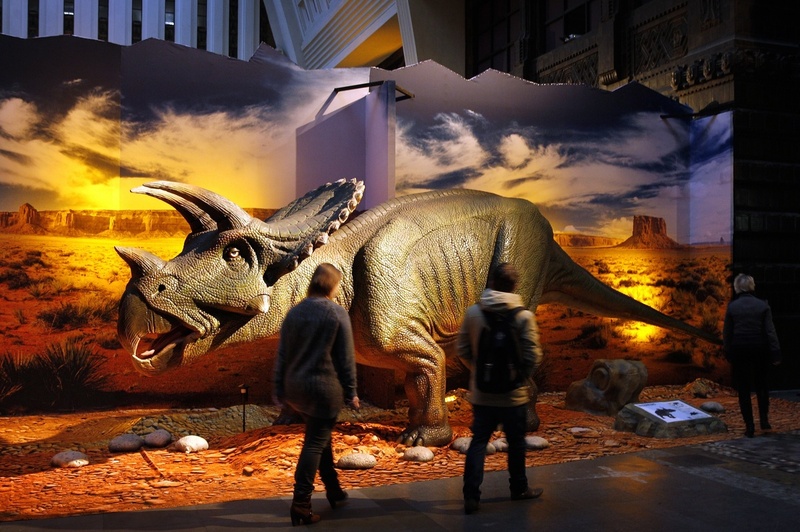 How do you explain the dinosaur fossil record if the world is only 6,000 years old? The debate has provoked a variety of responses. While the overwhelming majority of those polled think it was a clear victory for Nye, others have questioned the wisdom of his consenting to such a debate in the first place. The National Center for Science Education's Ann Reid and Glenn Branch, for example, warn against formal oral debates "if the goal is to improve the public's understanding of evolution and the nature of science." When it comes to the evidence for evolution, I don't have much to say. To quote Chris Mooney, "the case for evolution is a slam dunk." But the debate did reveal some surprising assumptions about the nature of science — on Ham's part — that have received less attention in debate postmortems, and that are worth some careful scrutiny. Ham began the debate by emphasizing the importance of defining one's terms, including the term "science." In particular, he made two strong claims about science and science education, captured on the presentation slide below. 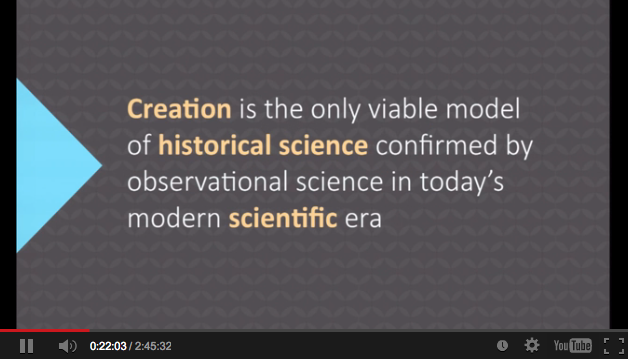 The first claim is that we should recognize an important distinction between "observational science," which concerns the here and now, and "historical science," which concerns origins, or the past. The second claim is that science is arbitrarily defined in a way that outlaws the supernatural. To get a sense of the status of these ideas in contemporary science and philosophy, I turned to my friend Michael Weisberg, a philosopher of science and associate professor of philosophy at the University of Pennsylvania. "Philosophers of science certainly recognize differences between historical sciences and what Ham is calling 'observational sciences' (we often use terms like 'nomothetic' to describe sciences like chemistry and physics). The main difference is simply that historical sciences like geology and evolutionary biology try to reconstruct the past, while other sciences like chemistry aren't especially concerned with any particular time period. Whenever one tries to reconstruct an event that has happened in the past, the direct evidence base will be limited. By definition, historical events have already happened and we won't be able to go out and have a look at them. "But very few studies, even of historical phenomena, are strictly limited to studying the historical record. For example, geologists re-create historical conditions in their laboratories to study the effects of these conditions, while evolutionary biologists might use genomic data to help reconstruct phylogenetic trees. So while there are certainly differences between these sciences, they are not fundamental." For Ham, the differences run much deeper; he wants to treat the conclusions of observational science as fundamentally different from those of historical science. In particular, he's willing to accept the former but wants to question the latter. As he said multiple times throughout the debate: We weren't there to see what happened, so we could be wrong. "There are many things that we can't see for ourselves, but about which we can make reliable inferences. Scientific methods help us ensure the reliability of these inferences, often by ruling out other possible explanations (confounding factors) and by bringing multiple, independent lines of evidence forward. This can be quite challenging for historical sciences. Darwin, ever aware of this challenge, brought studies of morphology, physiology, paleontology, and biogeography together to form the basis of his evolutionary theories. Modern evolutionists can add genetics and development to the mix." On the flip side, observational science can't offer guarantees, either. All scientific claims rest on defeasible assumptions. When we conclude that the Earth is round because it looks that way in photographs taken from space (one of Ham's examples, offered to reject the parallels between a historically young Earth and an observationally flat Earth), we're engaged in observational science, but it's science that rests on assumptions about optics and how our devices for measurement work, among other things. These happen to be assumptions that have held up very well over time and are supported by converging sources of evidence ... just like evolution. "I actually went through some predictions, and listed others, and there's a lot more that you can look at and you can go and test it for yourself. If this book [the Bible] really is true, it is so specific, it should explain the world, it should make sense of what we see. The flood? Yeah, we have fossils all over the world. The Tower of Babel? Yeah, different people groups, different languages, they have flood legends very similar to the Bible, creation legends similar to the Bible, there's so much you can look at ..."
So — sometimes — Ham seemed to endorse the idea that his model of creation makes predictions about what we should find in the natural world, and that what we observe (the findings of observational science) are relevant to the truth of that model (see presentation slide below). More generally, he appeared to endorse the idea that observational science constrains claims in historical science, where those claims can be supernatural. But this seems to be at odds with the idea that all bets are off when it comes to historical science, and also with his second claim about how science is defined: that it arbitrarily rules out the supernatural. If some claim makes observational predictions, then it's susceptible to scientific testing — that's arguably the hallmark of a scientific hypothesis. So Ham can't have it both ways: on the one hand claiming that empirical evidence supports a historical claim of (supernatural) creation, and on the other that creation has been arbitrarily and a priori ruled out by textbook definitions of science. This tension may have arisen from a peculiar feature of the debate. Nye and Ham spent much of their time contesting the evidence for evolution versus creation: the nature of the fossil record, the (im)plausibility of housing 7,000 kinds of animals on a boat built by Noah and his family, and so on. But their disagreement was much more fundamental, and concerned the very bases for belief, including the role of evidence versus revelation. These issues made occasional appearances, but were never truly engaged. Ham seemed to be debating Nye with ground rules that he didn't actually accept: that observable evidence should bear on one's beliefs about origins. 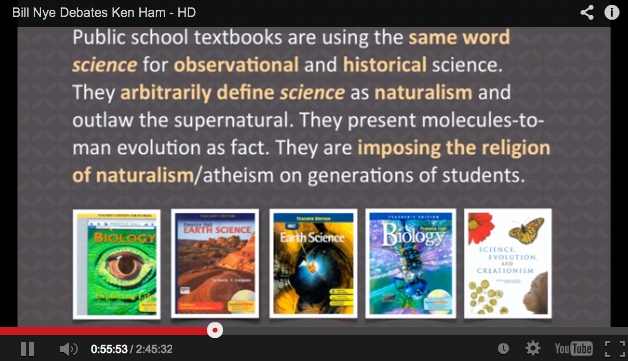 In the first half of the debate, Ham accused evolutionists of hijacking the word evolution using a "bait and switch." But the bigger bait and switch was the premise of the debate itself, which Ham ultimately rejected: that observable evidence and argument can and should change minds. At least, that's my take from watching a streamed version of the debate after it occurred. But of course, I can't say for sure. It was, after all, in the past, and I wasn't there to see what happened.